A successful and popular local Who’s Got Talent competition held in front of a live audience at The Devonport Playhouse, Plymouth, has raised £1100 to support research into Huntington’s disease at Plymouth University Peninsula Schools of Medicine and Dentistry. The winner of the competition was dance act Hollie Chapman, who won a cup and £250. There were also separate prizes for junior and senior acts. The winner was chosen by a panel of judges, including Marcus Alleyne, Sue Hooper and Edward Jacobs. The event also included a presentation from local Huntington’s fundraiser and Pride of Plymouth finalist, Jamie Lake. This is not the first time that Liz and her group of volunteers have held an event to raise money for this research. 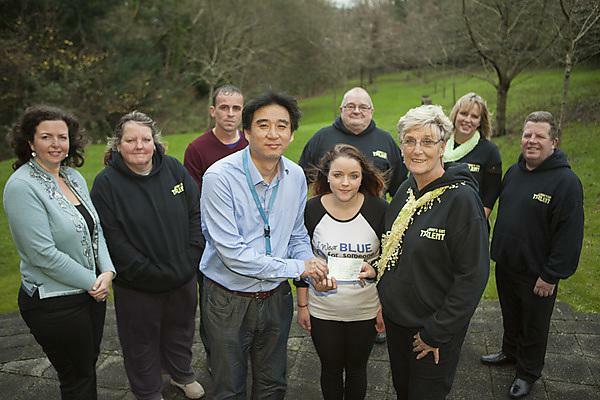 In August they raised £600 by holding a karaoke night at The Two Bridges Inn in Saltash. Local supporters of Huntington’s disease research have tasked themselves with raising £20,000 for a specialist piece of equipment called a Thermo Scientific Multiskan GO Microplate Spectrophotometer. This measures cell viability and levels of toxic proteins that are present in cells in neurological conditions such as Huntington’s, Parkinson’s and dementia. Plymouth researchers are investigating the potential of manipulating activity at a cellular level in order to develop an effective therapy for Huntington’s disease. The team re analysing a protein called Bim, which causes cell death in various tissues including those of the brain. At present it is unclear how Bim levels and activity increase in Huntington’s disease, and the study will aim to identify the mechanism which allows this increase. By understanding the mechanism and how it works, the way could be open for manipulating it to create an effective therapy for the disease. If you would like more information about research into Huntington’s disease, would like a laboratory tour or make a donation towards the equipment, please visit www.plymouth.ac.uk/campaign or contact Paola Simoneschi, Development Manager, Medical and Health, at p.simoneschi@plymouth.ac.uk or on 01752 588021.